It’s always nice to receive praise from a client for a job well done and having recently completed the brand-new Prospectus for Itchen Sixth Form College, that’s exactly the position we found ourselves in. We were tasked with creating a fresh, new-look prospectus for the 2018-2019 Academic Year, which would highlight the broad range of dynamic courses that the college offers, for those students looking to follow both vocational as well as academic pathways. Compared to previous versions of their prospectus, the client also wanted the re-design to be in a new and more user-friendly compact format - with more pages, only smaller. 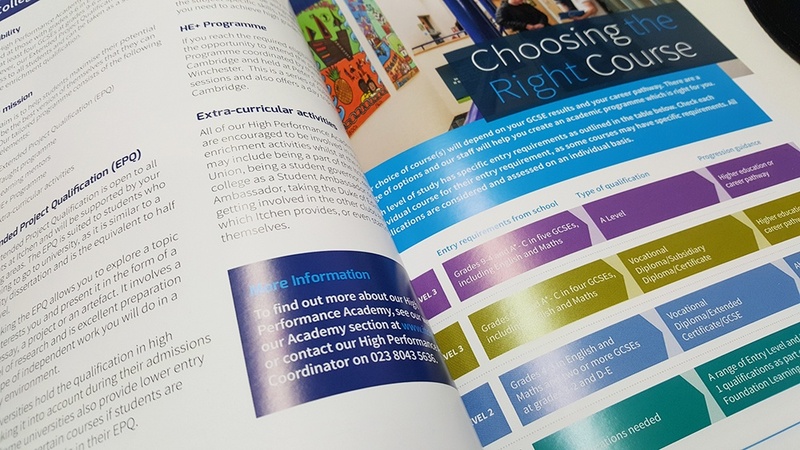 At Itchen College ‘every student matters, is known and feels valued’ and the client wanted to reinforce this positive inclusive message through their new prospectus. We are delighted with the positive feedback received from Itchen Sixth Form College for this project. “We’re very happy with how our new prospectus looks and we’ve already received lots of compliments from staff around the college. I’m sure it will prove to be a big success throughout the new year. Thanks to the design team at bandv for all of their hard work. At bandv we pride ourselves on careful planning and clear communication with clients to ensure that each project meets the desired requirements as set out in the original brief. At bandv we believe that great design makes a lasting impression, and as such is an integral part of all promotional material. Our in-house design team offers a broad range of design services including creative solutions for any print or online marketing including brochures, magazines, literature, product design, exhibition graphics and much more. To find out more about the design expertise bandv can offer simply get in touch to request a consultation.